FALSE FAVOURITE got beat – HURRAY. PLACE VALUE – Clearly needs at least 1m 4f. Back to Lay – Went off a bit quick but Katheefa reversed a 2l defeat into a 4l easy win for a 5lb pull! What is SWING BETTING on Betfair? When is this the right strategy? InsideTraxs takes you through an example. Using unique tools like the Weight of Money (WoM) Calculator we show you how to predict which way a horses’ price will move and when to back or lay. The NAP OF THE DAY runs at Kempton 5.10. Nearly got there LTO and Warren Greatrex felt he was unlucky and has a race like this in him. Fairly treated for that run he must have a very good chance at reasonable odds. A confirmed front runner he is drawn 2 with Poyle Vinnie on his inside. Back to a winning mark (he beat PV over course and distance last May) he has been running pretty consistently in higher class races off bigger marks. Nathan Evans sometimes springs a surprise so I am hoping he will get this horse out in front and they either don’t catch him or catch him in the last 1/2 furlong so that we can get a good back to lay through. The chart shows he has beaten his BSP on 12 of his last 13 runs. ADVICE: Back to Lay looking for 50%+ profit on your stake – unless he doesn’t get the lead then CASH OUT. Currently trading at around 10.0 our unique “Back to Lay Staking Calculator” will advise you to lay at 6.67 to get 50% return guaranteed on your money. 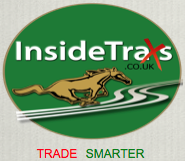 You can download the Excel spreadsheet with the “Back to Lay Staking Calculator” for FREE at www.InsideTraxs.co.uk it’s on the bottom of the homepage; with our “Weight of Money Calculator” and our “Weighting Calculator” – which tells you if a horse is over or under weight in the betting – also there for FREE download. In terrific form since turn of the year. Up 26lbs since start of his winning run and now meets some smart horses. The Doyler is booked for Secret Art and I would have him some way ahead of this favourite. At the odds of 3.55 on Betfai this horse has to be a lay bet for me. Most of these are inexperienced and so I go with one of the two horses who have form on this surface. It’s like marmite and so this is the lowest risk option and the selection has run once, come third on this surface. He comes from a good yard and so will have a better than a coin tosses chance of being in the top 3. Copyright © 2019 InsideTraxs, All rights reserved.